You know you love the game. You spend weekends, and sometimes a little time after work at the course, practicing and improving your game. Maybe you started playing as a teenager, or took up the sport later in life. But what about your children? You want to share your favorite pastime with them, but when do you start? How early is too early, and what’s wrong with starting late? How and When to Introduce Golf to Your Child? How Do I Know My Child is Ready For Golf Lessons? How can I get my daughter interested in Golf? Is the golf grip important for kids? Should I buy plastic golf clubs? Is golf too difficult for a 5 year old? What is the correct equipment for young golfers? Bring your child along with you to the course and allow them to watch you play. Some parents bring young children along, and even get them to try and whack the ball, divots be damned. Please be sure to consider safety first as a golf club can cause damage. It is important that children can safely swing a club without letting it go or accidentally hitting anyone near them. There are some children that are able to stand still long enough and with enough focus. Change positions and get their hands right at a young age. Other children will be into their teens before they can seriously consider golfing lessons. Experts say that if your child is at the point where they can hit the ball 100 yards, they are ready to join the club and you may start them with formal lessons. When that happens could be at any age between 10-16. However, one golfer said she started golf at 10 and wished, upon reflection, that she had started earlier. Unsure if your child is ready but are not quite sure? Sign him or her up for one or two lessons. If they are enjoying it and making progress you can keep up the lessons. However if they find it difficult and stressful, let them just play around until they can tolerate structured lessons around the sport. At this point if they are not interested in lessons invite them to the range or for a ride on the cart. Have them bring their clubs they may just impress you and themselves. One lifetime golfer started at the course when her father brought her there at the age of five. She rode around in the golf cart next to him, and hopped out to play. He let her tap the ball into the hole when the opportunity arrived. She grew up to play the game herself, and taught it to her daughter, too. While the National Golf Foundation said in its Report on Junior Golfers that kids who start young are more likely to play golf as adults. The minimum age for young golfers’ memberships at many courses is 16. So you have to fit in some golf-related activity with your child, Even if they don't want lessons. Arnold Palmer often tells the story of his father teaching him the grip at a young age. It stuck with him for life. The fundamentals of the golf grip are fairly simple. Use this as an easy guide for the golf grip, who knows it may help you as well. You can introduce golf basics to your child if they are seven, and perhaps by the age of 12 they will be ready for formal lessons. Golf should be enjoyable and fun, and although it will be hard for you. Leave the critiques and analysis for your child’s teacher. Kind encouragement and treats on the course will go much farther in creating love for the sport. Critiquing your child’s setup and swing or accuracy will come in years to come. Even though it may not look like they are learning much the lessons you give them in patience and empathy are lifelong. So how do you ensure that golf is an option for your child? Begin in your own home or yard. 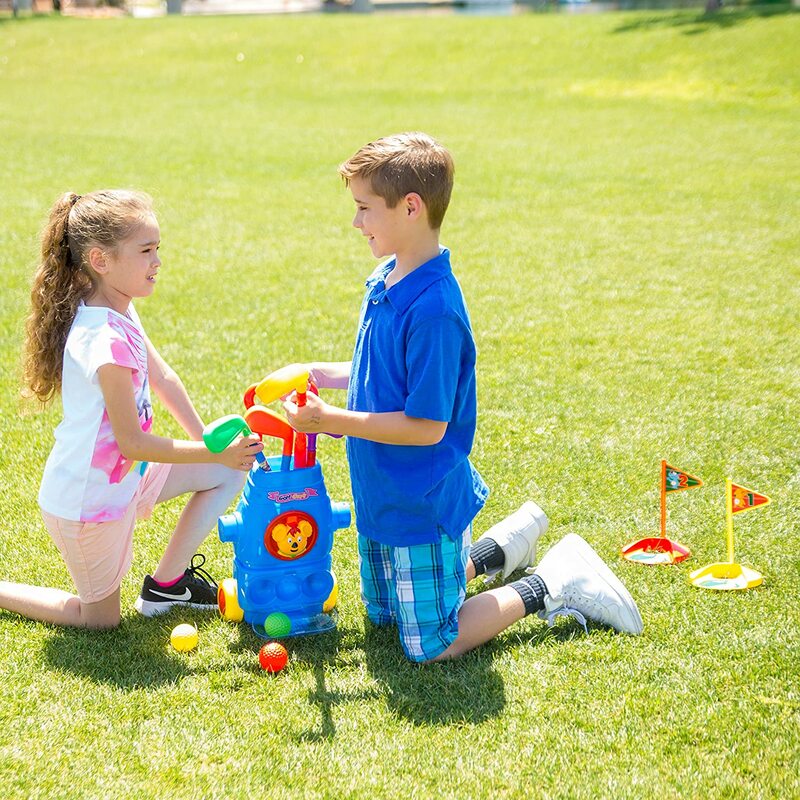 Allow your young child to play with plastic golf sets not only will they develop some hand eye co-ordination. They will have fun that way and learn organization. A simple plastic golf set like this can be found on amazon! Golf can be a difficult sport to play, especially for kids. At their young age, accuracy in hitting the ball is not consistent. Golf teachers say never focus on that aspect of the game. Frustration will very likely set in and you may end up turning your son or daughter away from the game entirely. Minimum instruction small corrections and maximum fun is the key to grow a love for the sport. Your child will want to learn to play and seek out further instruction when they are older. Miniature golf is a great way to have fun and learn putting away from the course. The correct equipment can make or break the game for children. You might be tempted to just saw one of your old clubs down to the chest-high length for your child. They will be weighed down by the material, and immobilized by the stiffness of your club. Provide light-weight, right-sized clubs for your child. It will give them a sense of ownership and ensure they are physically more relaxed when they play. 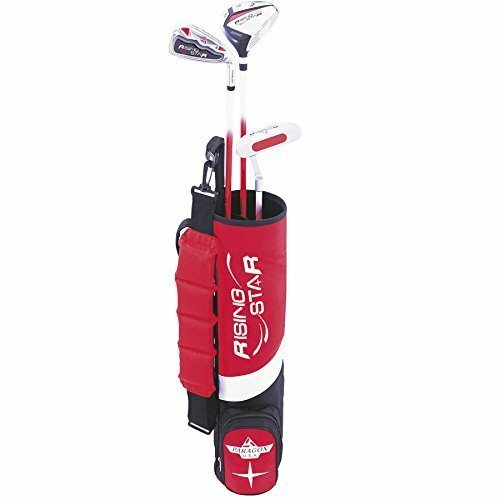 This Rising Star Golf Set can be found on Amazon with an affordable price. It will make a great gift to be used and passed down for a long time to come. With all this being said, the real catch to encouraging your child to play golf, is you. Spending time with you at a sport that you enjoy is the key! Sharing the outdoor weather and the time spent together is what makes for a great day. You will be your child’s first golf playing partner and mentor. No matter what age they start lessons, they will develop a love for the game and motivation from you.